"Is your life not inconvenient enough? Buy an RV." That's a joke my husband and I came up with 7 years ago. We were in the middle of our epic 9 day road trip through Southern Utah. It was just the two of us, our jeep, and our tent. Every night we set up the tent in a different campground, and every morning we packed the tent and other camping gear into our jeep and travelled to the next location. It was basically our dream vacation. One night, as we sat around our camp fire in Arches National Park, we started making up silly tag lines for the things around us. Most weren't that memorable or funny, but the one about RV's stood out and became a long-running joke. We couldn't understand why anyone would want to travel with a cumberson RV. Over the years we'd repeat "Is your life not inconvient enough? Buy an RV." Every time we saw someone trying to navigate a parking lot in an RV. Two years ago, when we moved to Fort Rucker, Alabama, I met a family at church who had moved out of their Army housing to live in a trailer at the Campground on Fort Rucker. During our 18 months in Alabama I knew four other family's that made the same decision. Some of them lived in trailers, others lived in RVs. I knew they were saving money by living in RVs/trailers rather than the on post housing. 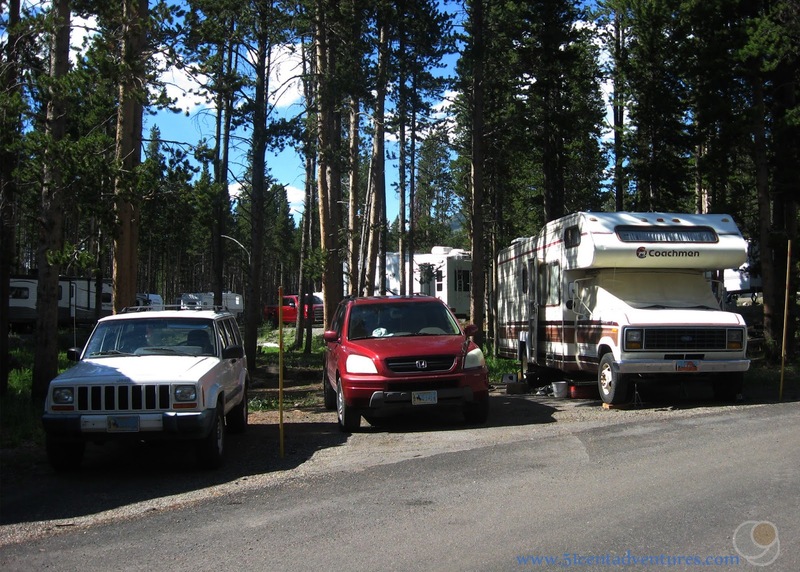 My husband and I briefly talked about maybe doing the same thing, but we ultimately decided that there was no way on earth we would ever give up our four bedroom house - or all our stuff- to live in an RV. Little did we know the interesting turns that were coming up in our lives. 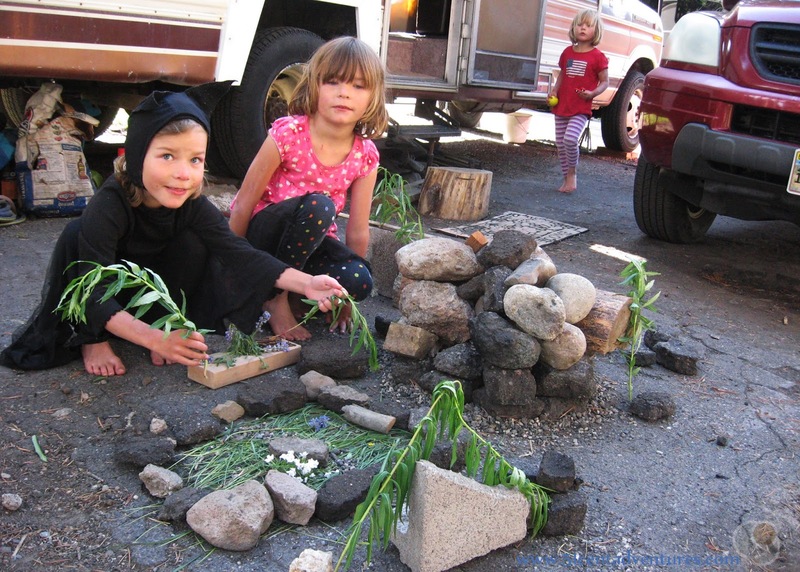 My husband decided to get out of the military, I decided to go work in Yellowstone, and that meant our family of 6 was going to live in an RV for three months. I'll admit I was a little worried about the logistics of daily life in a space as big as the master bathroom/walk in closet of our Alabama home. But with careful planning we've been able to make it work. 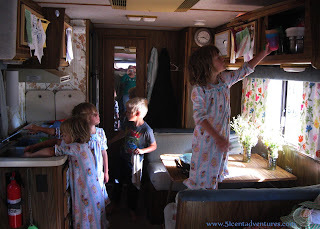 In a previous post I showed all the updates we did to the RV to make it into a living space. Today I want to do a post highlighting many of the ways that we make this unusual living arrangement work for us. As you'll see we've learned a lot of things about simplifying our lives. Here's a picture of our campsite. We have the jeep which I take to work (special thanks to my in-laws for bringing it up to me when I got promoted and had to start commuting), the Honda which my husband and kids take on their adventures, and the RV where we live. The campground supplies ectricity and water and has a sewage connection as well. The only thing we don't have ready access to is hot water. But that's our own fault. On the second day here our water heater tank started leaking. After working on it for a while my husband decided that it couldn't be fixed easily or cheaply while living in the middle of no where. So we haven't had any hot water while we've lived here. 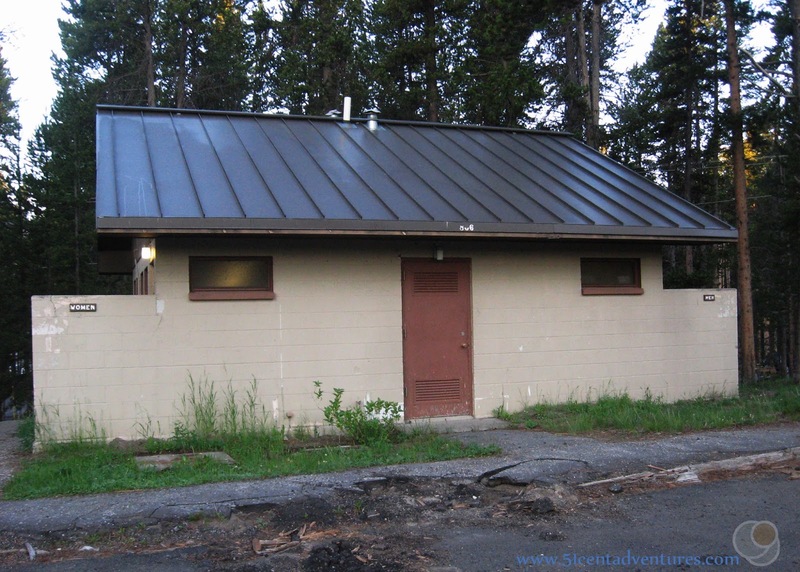 That's not as big of a problem as it sounds because we have a bath house with showers located just a few yards from our campsite. (And quite honestly I planned on showering at the bathhouse even before our hot water heater broke so it wasn't that big of a loss anyway.) The kids quickly learned to take showers instead of baths. There is a laundry room located on the back side of the bath house. 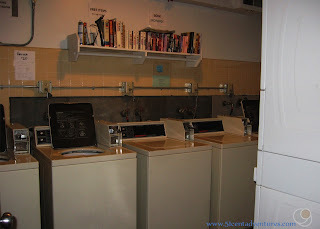 This is where we do laundry once a week. It costs $1.00 to wash a load and .25 for 10 minutes in the dryer. 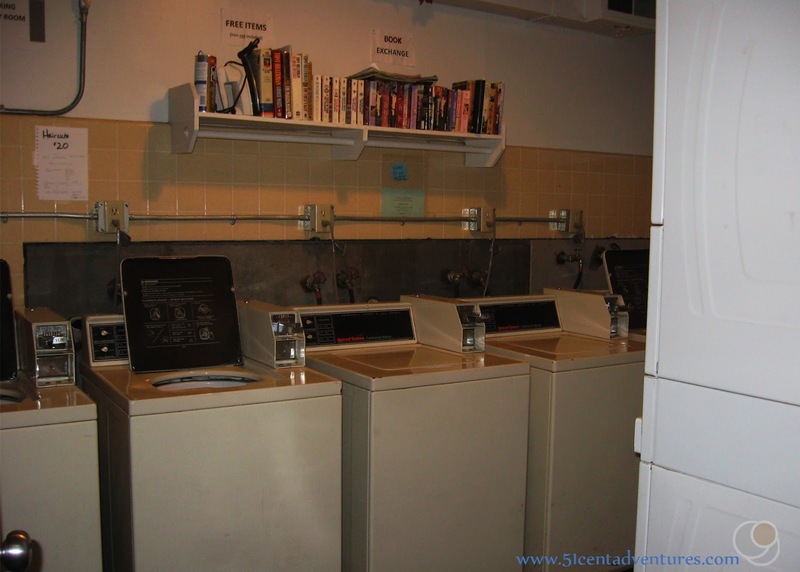 The prices aren't terrible, but they have certainly made us more conscious of how much laundry we do. Over the last few years we've been in the habit of considering everything dirty after it's been worn once (side effects of having a house full of babies that spit up and have leaky diapers) but now everyone will wear clothes for a day or two before putting them into the dirty clothes. 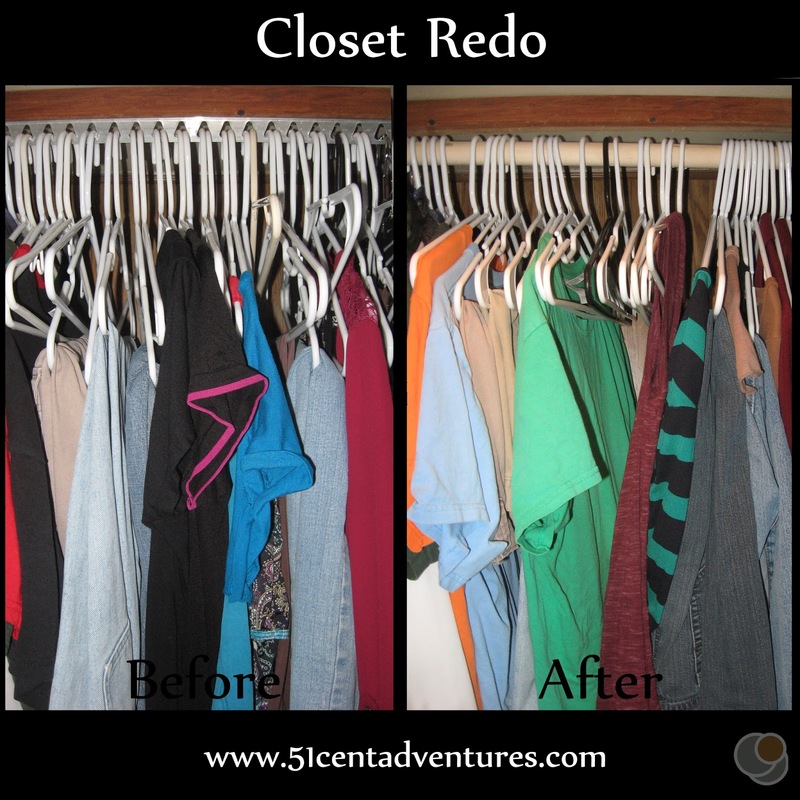 Another reason we are so willing to wear clothes over multiple days is that we didn't bring that many clothes to begin with. We have a dresser in the living room that the kids all share. Each child has one drawer that has to hold all their clothes. Each child brought 4 pairs of pajamas, 8 shirts and 8 pants/shorts. 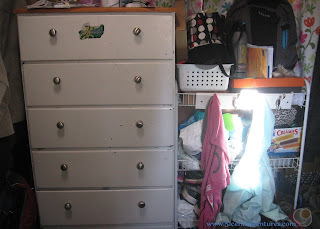 My husband and I use the top drawer of the dresser for our socks and pajamas. 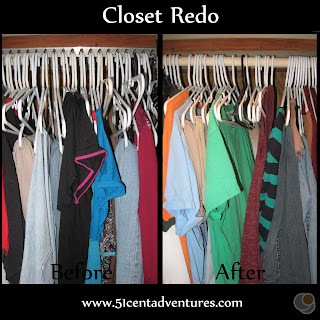 The rest of our clothes are in the closet in the bathroom. We also have about 8 shirts, 8 pants/shorts and 4 pairs of pajamas. It was so hard to pair down my clothes to that few outfits. And actually I cheated and brought "pajama" shirts that I don't mind wearing out in public. Also, with my promotion I can wear my own clothes instead of an ugly uniform. Which would be awesome if I'd brought any business casual clothes. Luckily I was able to do some successful emergency thrift shopping in Cody and find clothes that will work. Our closet came with a really annoying way of hanging clothes. We had to put each hangar into its own slot. 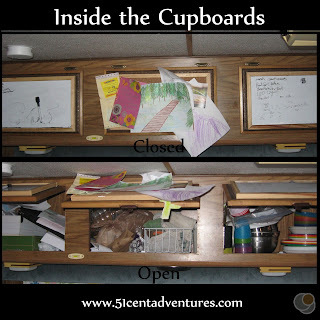 This is a great system if you are driving around the RV and you don't want your clothes sliding around while you drive. But it's annoying if you are trying to push clothes out of the way. So a few weeks ago my husband installed a real curtain rod. This makes hanging up clean clothes almost enjoyable. You may be wondering where we put our dirty clothes. Well, we've blocked off the drivers and passengers seats with some curtains. We keep a laundry basket on the drivers seat. That's where we put our dirty clothes. The passenger seat holds boxes where we store some of our food. We keep the stuff for our Sunday church service between the seats and in the foot room areas. And on top of that we keep the pillows and blankets that my husband and I sleep with each night. 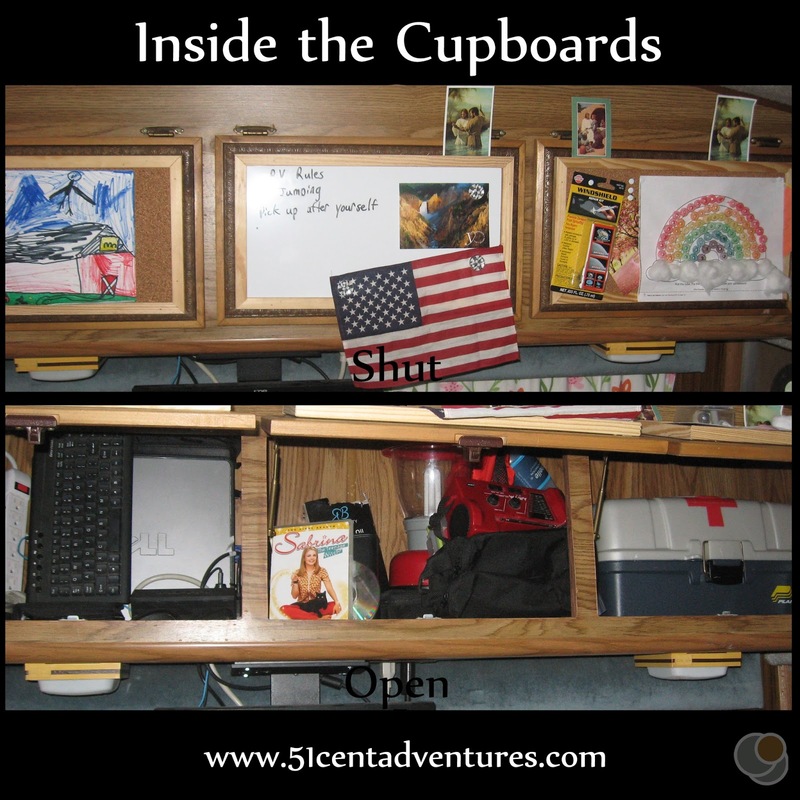 When my nephew was visiting he wanted to see inside all our cupboards. So I thought that you might want to see inside each of them too. 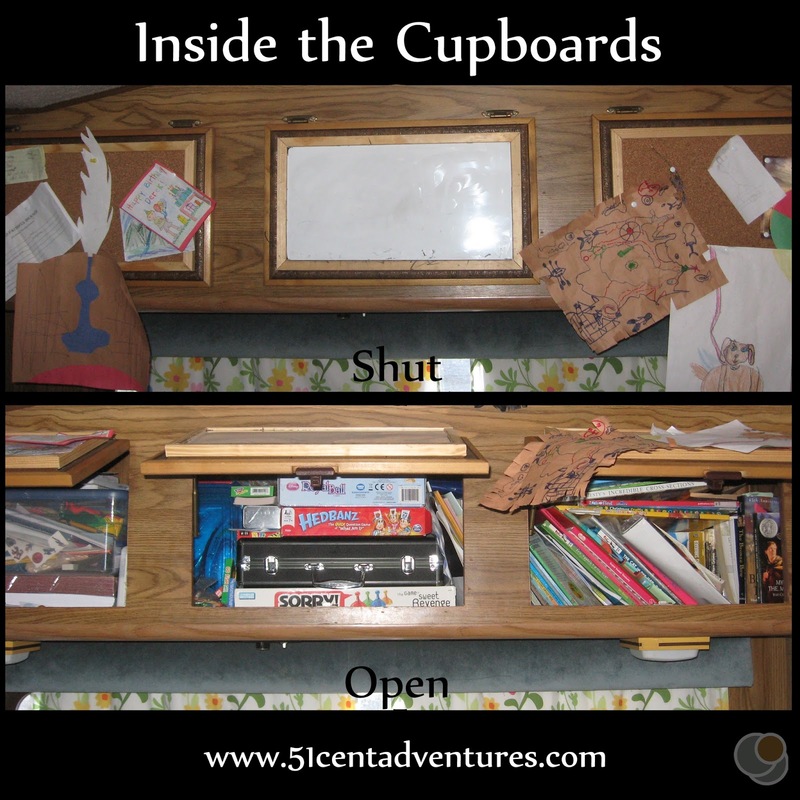 Let's start with one of the living room cupboards. On the outside it has some random drawings and art projects. On the inside it holds the computer that is hooked up to our monitor, our DVD's (we really enjoyed the first season of Sabrina the Teenage Witch) and our first aid kit and some other emergency supplies. The other living room cupboard is much the same on the outside, but on the inside it's very different. 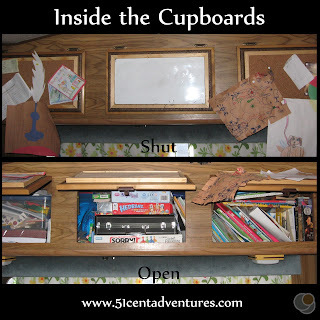 The kids can reach this cupboard if they stand on the couch so we put lots of things for them in the cupboard. One side has art supplies in a big tote, the middle has games, and the other side has lots of books. Every evening I read to the kids while they fall asleep. So far we've read Where the Red Fern Grows, Home Alone, Bunicula, and My Side of the Mountain (so far this was our favorite - maybe because we can relate to the main character) We are currently reading the Silver Crown and I'm hoping to read two or three other books before the summer is over. In the kitchen cupboards we have dishes, dish rags, and my husband's school text books. 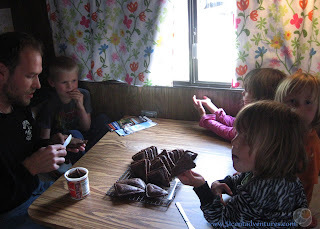 One of my favorite things about the RV is that we are connected to electricity. So we can easily use things like the TV and the microwave. 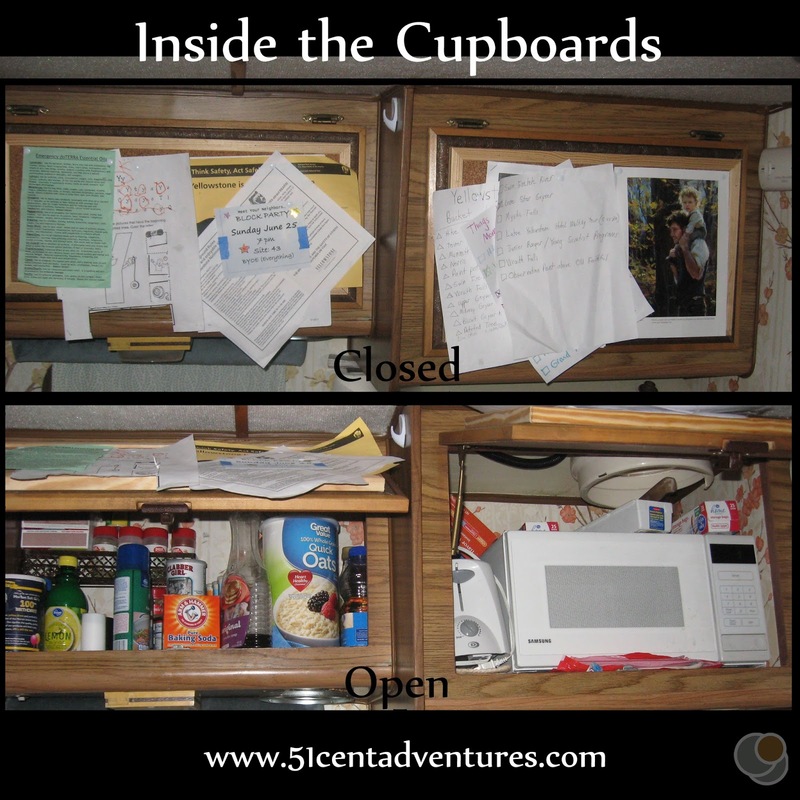 Since we have hardly any counter space (technically we have none) we keep the microwave in a cupboard. 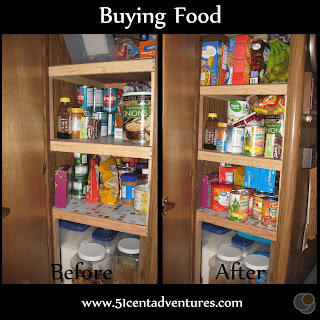 The cupboard next to it has all our spices and other baking things. Food prices in the park are expensive, and they aren't much better in the towns near the park. Our nearest Walmart is 90 miles away in Cody. 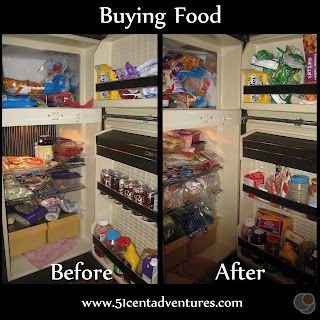 So we knew we would have to use all of our food storage skills. The biggest change to how we eat is that we can't buy milk - there just isn't room in the fridge for it. Even without milk we we pack the fridge full every two weeks and then gradually empty it out. 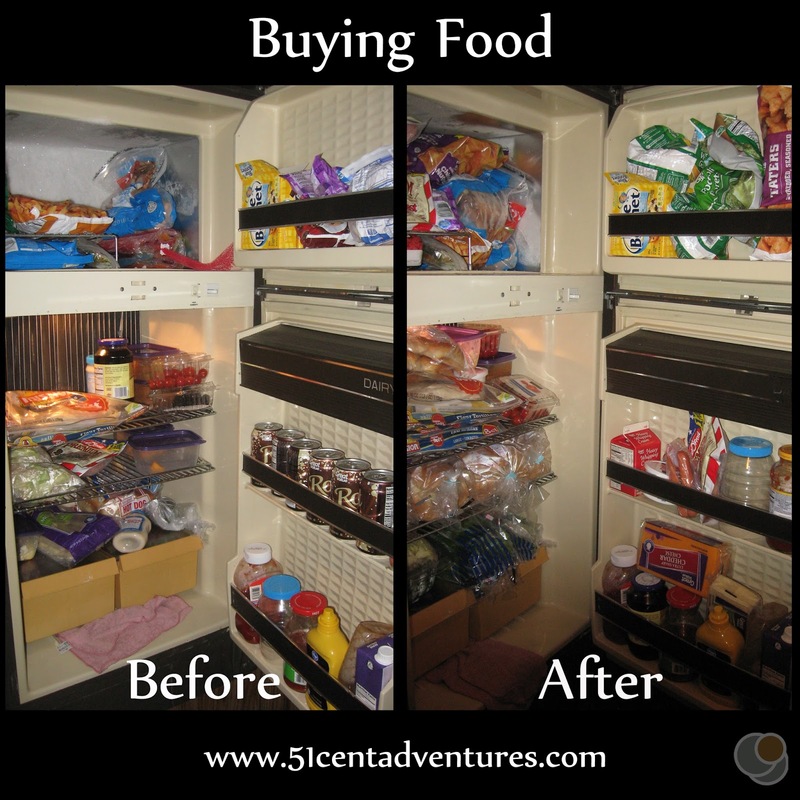 Here's a picture of what the fridge looks like before a shopping trip and after. 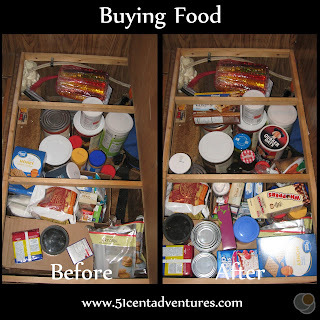 The same thing happens in our pantry. We have a pretty good stock pile of canned food and other non perishable things. We also have a good supply of treats that we keep on the top shelf. We give the kids treats like gummy worms and Swedish fish for eating all their dinner, and for helping do the dishes. My husband also packs treats to help motivate the kids while hiking. 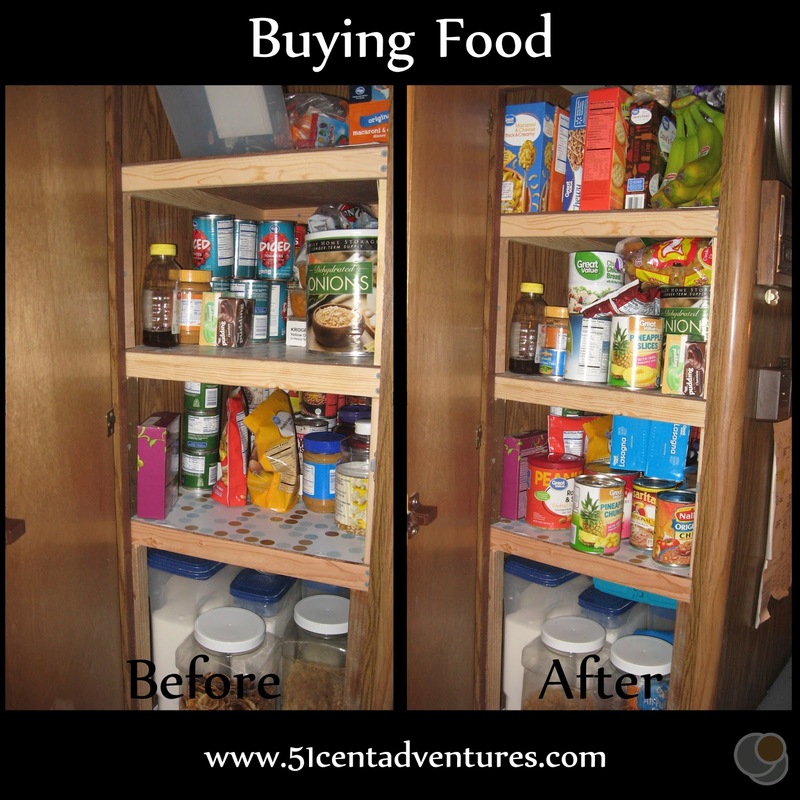 We also store food in a cupboard under one of the dinette seats. 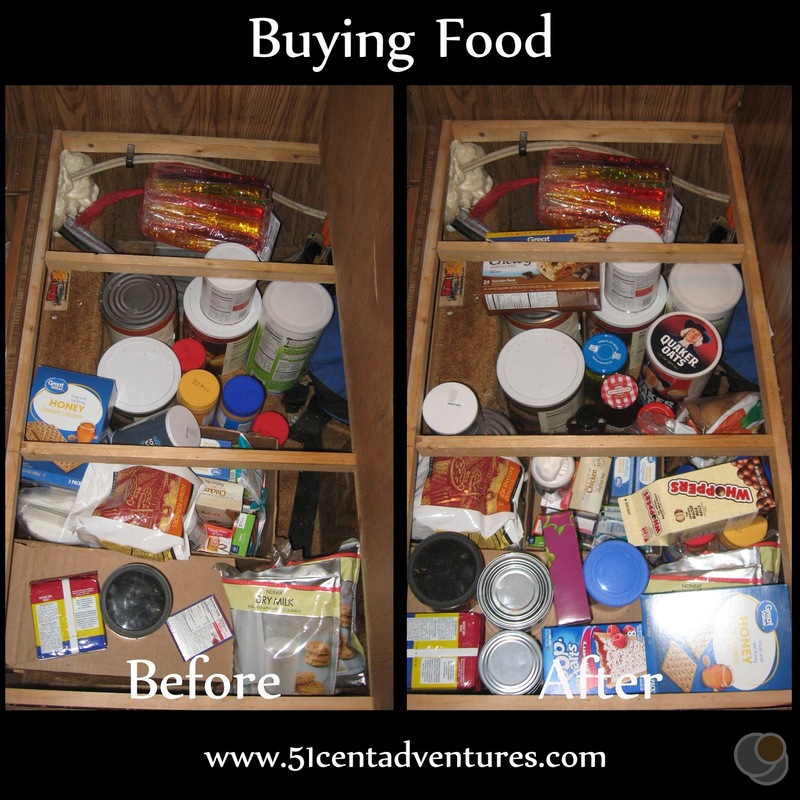 This is where all the extra food goes before it goes into the pantry. Before we came here we went to the LDS cannery store in Ogden and bought big cans of dehydrated apples, potatoes, milk, onions, and oatmeal. We also went to Gosners Cheese in Logan Utah and bought two big cases of shelf milk. This cupboard works well, but it apparently is easy to get to from the outside because we found signs that mice had been in there. So we set a mouse trap. So far we've caught four mice. 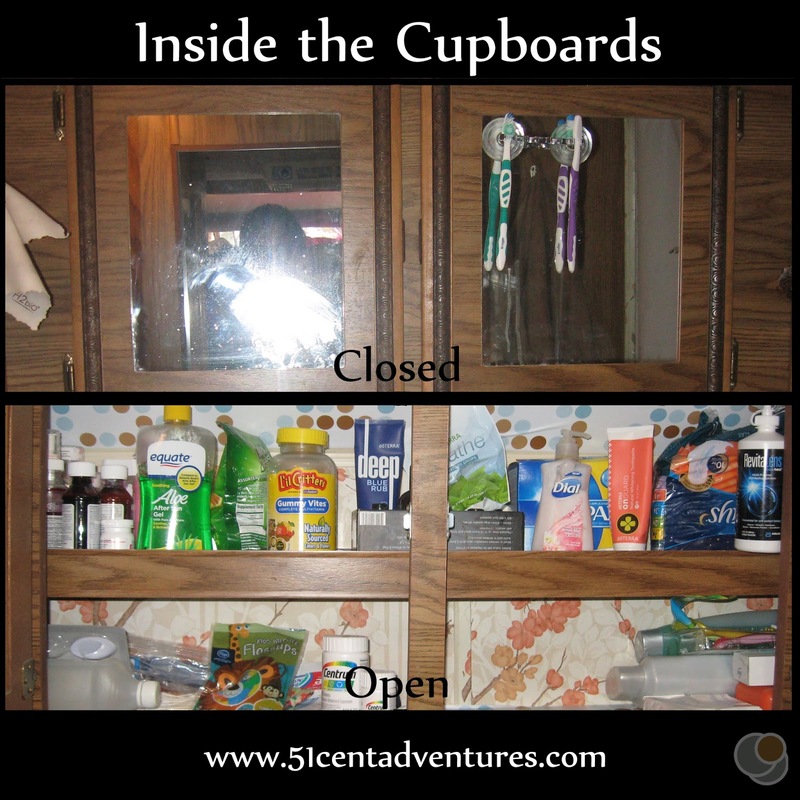 The final cupboard is the bathroom cupboard. This is where the extra toothpaste, soap, and shampoo is stored as well as all our medicine. I was really worried that the kids would get sick while we were living here so we made sure to come prepared. But so far no one has been sick yet. My husband had our propane tank filled before we came here and it lasted us until July. (It helped that we didn't have to have to heat the hot water tank.) When the propane started running low we weren't sure how we would refill the tank. In theory we could just drive the RV to one of the gas stations in the park and have them refill the propane, but that seemed like a giant hassle. Our RV is on leveling blocks and I did not enjoy the thought of taking it off the blocks, driving it, and then trying to get it level again. So I was pretty happy when we asked around and discovered that Amerigas would come to us and refill the tank. Amerigas has terrible customer service, but even that was worth dealing with so we didn't have to move the RV. While we were working on the propane problem we still had to eat. 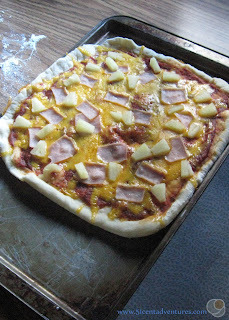 One night we wanted Pizza, but we didn't want to use the propane powered pizza oven. So my husband figured out how to make pizza in the electric skillet. It turned out really well. 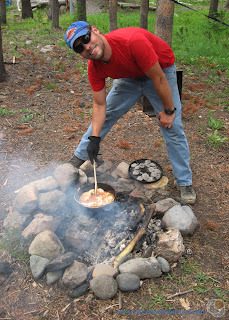 He also likes to cook with our new dutch oven. We bought this for our wedding anniversary back in May. Cast iron is the traditional 10 year gift, right? Another creative cooking technique we use is to make cake in a sandwich maker. We actually figured this one back in our college days. We'd been ready to make a cake when the heating element in our oven went out. We decided to try to cook the cake in the sandwich maker and discovered that it worked. This technique comes in handy on days when you don't want to heat up your house when you turn on the oven. I've actually been really surprised by how many normal things we can do in our tiny kitchen. Here are the twins helping make a treat that they saw in a magazine. One of the biggest differences in how we live is the amount of TV everyone watches. Our kids loved vegging out and watching Netflix and stupid YouTube channels. But we don't have the internet here so they can't do that. If they do watch something it's usually a movie in the afternoon or evening. The rest of the time they have to entertain themselves. After going through some withdrawals they've discovered all the fun things that they can do. 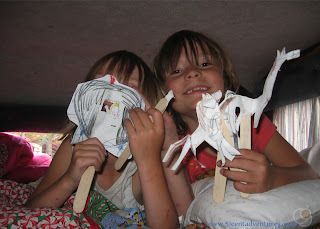 One day I came home from work and the twins proudly showed me the puppets they'd made. Then they acted out the story of Cinderella. I think my son has benefited the most from the reduction in TV time. He's always loved letters but he's never liked writing or even drawing for that matter. Well lately he's been sitting down and writing his alphabet letters. One night he picked up a park newspaper and wanted me to help him cut out the pictures. 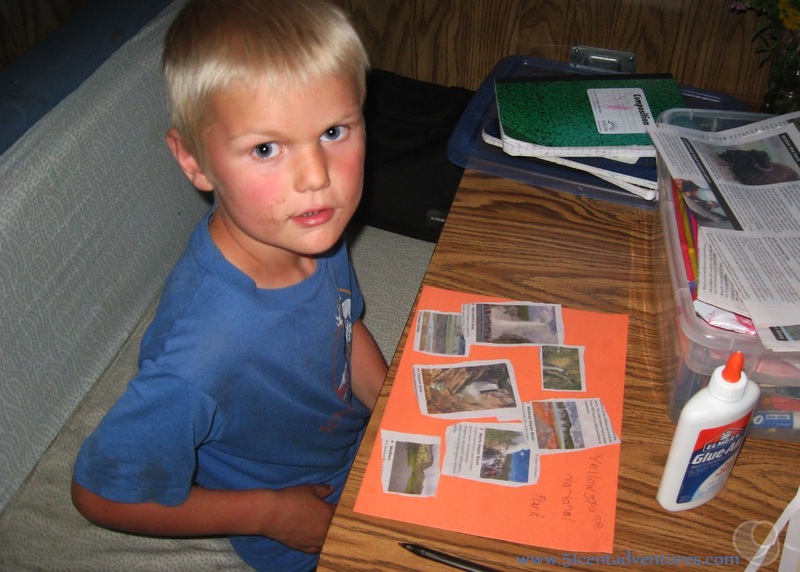 We cut the pictures out together and then glued them onto a piece of paper. Then I told him how to spell Yellowstone National Park and he carefully wrote each letter. He actually knew how to spell Yellow all by himself. This project kept him busy for at least an hour and a half. It was incredible. And what's my youngest daughter been doing? Well she's always enjoyed playing with odd things and that really hasn't changed much. Here she is playing with the dice that she earned when she finished potty training. 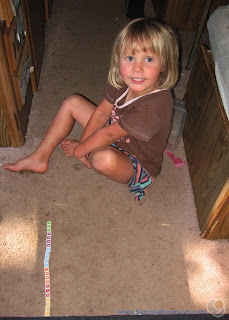 (This girl is funny, my husband told her she could have any toy on the toy aisle and she picked dice?) They came with a little bag that she'll take with her everywhere - even on little hikes. But we've also noticed her pretending more than she used to. She has little stuffed animals that she'll talk with and play with. Its fun to see her using her imagination. 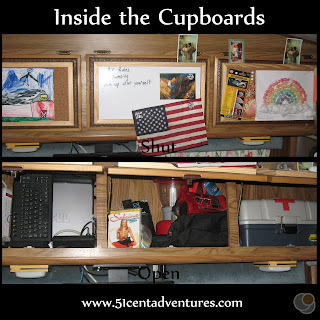 So is living in an RV an inconvenient life like I always assumed? Yes and No. Yes because we do have to do things in a rather deliberate manner. We can't just leave the dishes in the sink all day or we can't just leave clean laundry in a basket on the couch. We have to clean throughout the day. 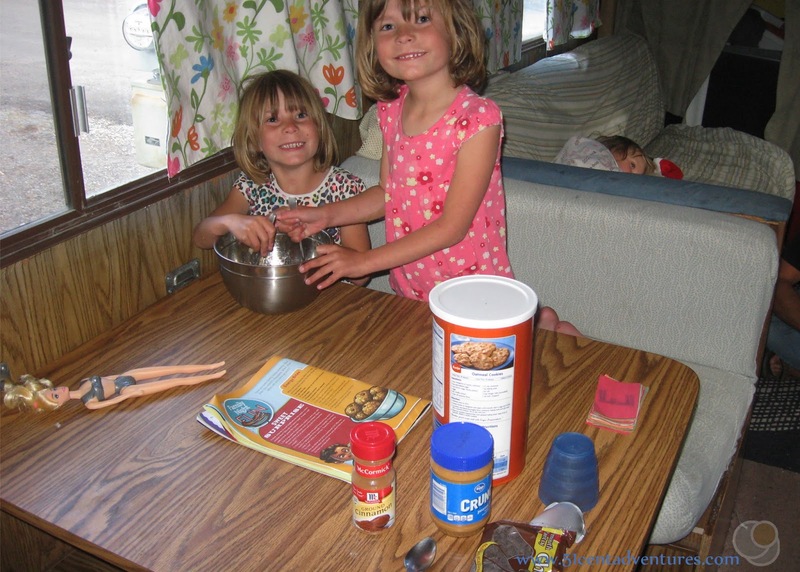 But honestly living in the RV has helped us develop habits that we probably should have had anyway. Living here has really helped us slow down and connect as a family. I love how close we feel emotionally as well as physically. I love the little moments when the twins are playing in the loft, my daughter is playing on the floor, my husband is cooking, and I'm sitting at the table helping my son draw. I love how we are all together. So maybe I should change the tagline to "Is your life not mindful enough? Buy an RV." That being said, I'm also looking forward to next month when we have a "real" house again. 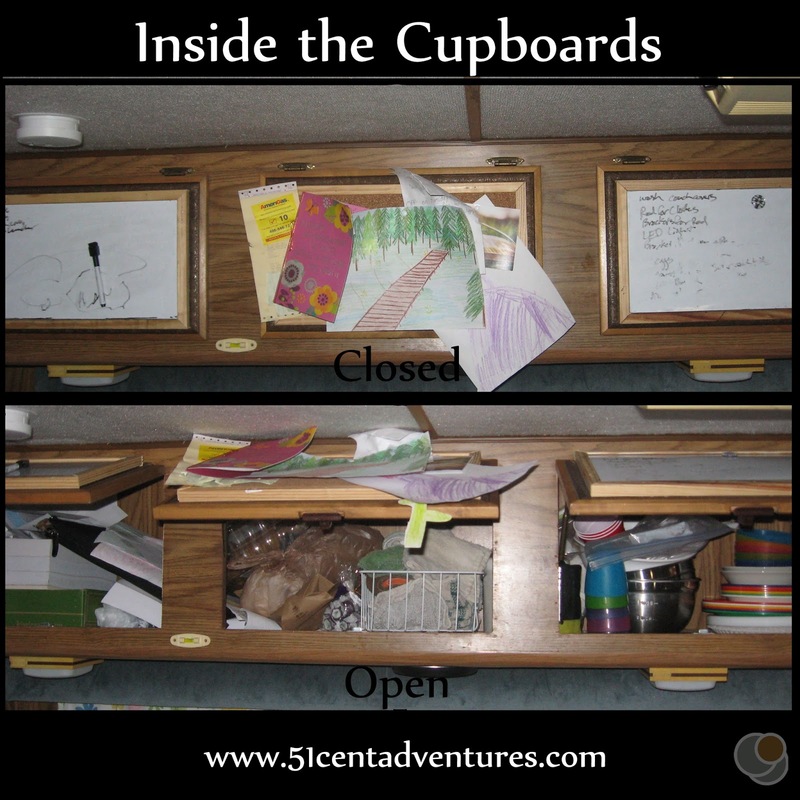 My husband and I kicked around the idea of living in the RV for at least a few months when he starts school, but neither of us could see it working very well. 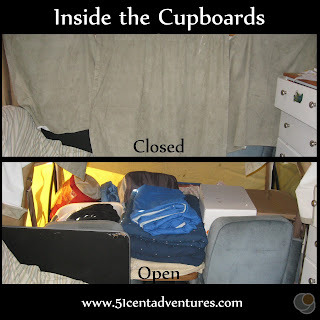 Maybe it could work if we didn't have kids, but with four school aged children I don't want to deal with the chaos of trying to get them fed and out the door every morning in such a small space. So within the next month we'll be moving into a rental house in Pocatello, Idaho and getting our stuff out of storage for the first time in 8 months. Sometimes when the RV starts feeling a little small I tell myself, "In just a few more weeks you can sleep in your King Size bed again." That thought keeps me going. But in the meantime I'm so glad that we've had this chance to live in the RV. It's definitely not something I ever thought I would do, but it has been so enjoyable.